"You shattered my heart(s) but I filled it with glitter!" ***Excuse my depiction of shatter. I learned the hard way that it's not the easiest to do without a proper texture brush! This was a fairly easy design to do. 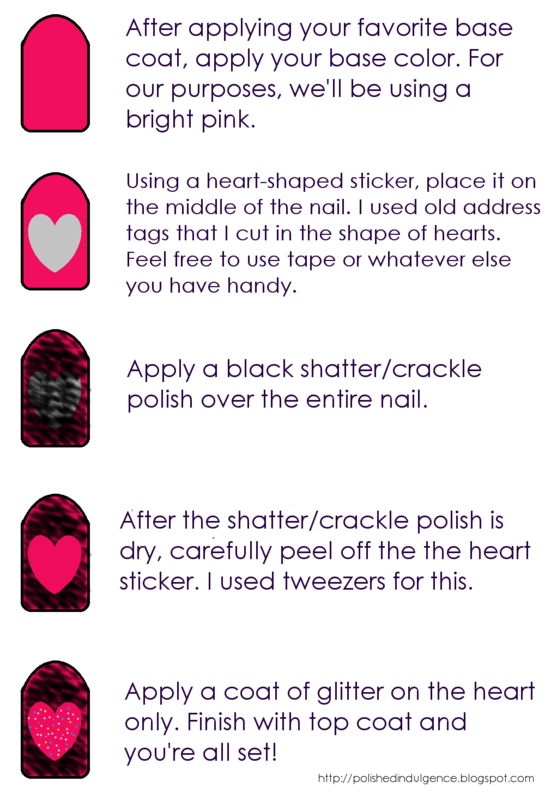 The only tricky part is cutting out the hearts so that they're small enough to fit the nail width without being too small that they aren't noticeable. 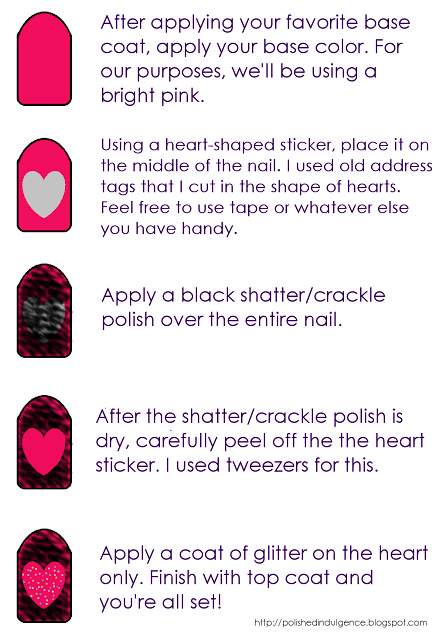 In fact, my first attempt came out too small so I ended up using it on my thumb, along with another heart. You can even do away with this entirely if you have heart shaped stickers lying around the house (I know my scrapbooking sis in law would probably have a ton!). The glitter on the hearts was a last minute addition to make the hearts pop all the more. I honestly think it would have looked all the more better if I used a matte top coat to finish off the look. Also, doesn't it remind you of those kindergarten artwork where you fill a piece of paper with color (using crayons or paint) and then the teacher applies black paint on top and when it dries you get to etch the paint? I'd like to think of it as an optimistic take on being broken hearted. You realize your true strength when you're down in the dumps. A healed heart shines all the more because it has known hurt and has risen above it. A good heart is soft as a marshmallow, yet tough as steel. No cutesy V-day nails here. Do you remember Moist or David Usher? Will you be sporting a V-day manicure? Have you ever been heartbroken? Sophie February 8, 2012 at 8:45 a.m. I love what you did here! I think Valentine's day is overestimated. When you love someone, you can bring flowers every day you like! My anniversary is su much more special to me. And no, I've not been heartbroken, lucky me. First choice was a good one, it seems! Thalie February 8, 2012 at 10:57 a.m. Thanks for sharing how you did it.It's very pretty and unique looking! Carmela February 8, 2012 at 1:23 p.m.
You're welcome, Thalie! I'm glad you like it! :D Will you be trying your hand at it? Carmela February 8, 2012 at 1:25 p.m. Thanks, Sophie! :) I have to agree. My hubby and I aren't big on holidays ourselves as we find it's the little things that you do everyday that matters more. MariJo Nails February 8, 2012 at 1:34 p.m. I love this Carmela!! It's such a funky V day mani! I want to do a fun mani, but I just don't know what yet. I'm sure I'll come up with something. Oh, and who hasn't been heartbroken? Thankfully, not recently though. Carmela February 8, 2012 at 6:58 p.m. Thanks, Marisa! I wasn't sure how it was going to turn out when I got the idea but I'm glad it worked. Just not as emo/gloomy as I originally intended. ;) Looking forward to it! I thought the same but apparently there's a rare breed that hasn't ever experienced it. Just like Sophie down there. Lucky girl, isn't she? MariJo Nails February 10, 2012 at 7:56 a.m.
Mary February 14, 2012 at 3:20 p.m.
Hahaha, oh my gosh! I haven't thought of David Usher since I was in high school. I totally loved that song back then and had a little crush on him. But since then, I haven't really followed his career. Wow, that takes me back! What a creative nail-design idea! :) It turned out so well - reminds me of a painting on a canvas. Nicely done! Carmela February 17, 2012 at 2:14 p.m.
Marta March 2, 2012 at 7:20 p.m. This is both edgy and cute! 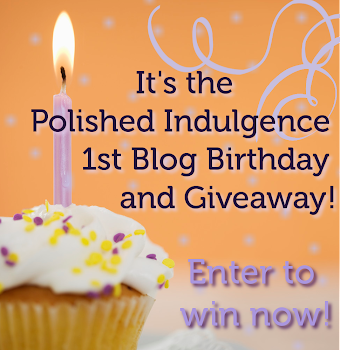 Indulgent Intermission: A Whole Lotta Tags!